For most of our Legacy users, this free update is a maintenance update which includes several minor bug fixes that you have reported. For those with access to New FamilySearch, we've made some great changes. See the download instructions below for step-by-step instructions on installing this update. View the April 25 and April 28, 2010 release notes by clicking here. - Relationships: at Tools > Set Relationships we've added the ability to show the closest relationship (which would display for example, 3rd great-grand uncle before it would show 4th great-grandfather) or the closest direct-line relationship (which would show 4th great-grandfather before 3rd great-grand uncle). Because the programmers have done a lot of work recently with the relationships, we recommend resetting yours by going to Tools > Set Relationships. For more on relationships, read "How is my father's brother's son's daughter related to me?" - LegacyFamilySearch: 1) In preparation for being able to copy information back/forth between Legacy and new.familysearch.org, we've added the ability to view all of a person's events. Previously it was limited to just showing a person's vital events. 2) We've also added section headers to the "My Legacy Person" and "FamilySearch Person" views to better organize the information. For those wondering when FamilySearch will open their new database to the general public, David Rencher, Chief Genealogical Offier of FamilySearch, was recently asked by fellow geneablogger, Randy Seaver, "When can we expect the non-LDS members to have access? Is there a crystal ball there?" Below is Mr. Rencher's response. "I don't know that I have a crystal ball. From all accounts, I don't have a date. Hopefully, either later this year or early next year. We're hoping that it's soon. There are some things that I want to make sure that the known challenges and issues are identified, or that we have an answer for, they may or may not be fixed yet, but at least we can share the genealogical community that "yes, it is on our radar, yes we understand that it doesn't work exactly the way you want it to, and yes we are going to fix it." Those are the kinds of messages that we will have to make sure the people will understand, and that the people will withhold judgment on the "new baby" until it matures a little bit." there is one conference that anyone with a desire to be a professional researcher should attend. The International Commission for the Accreditation of Professional Genealogists (ICAPGen) has announced a free one-day seminar to help prepare genealogists to become accredited. The seminar will be conducted on Tuesday, April 27, 2010. Space is limited so early registration is recommended. To register for the free one-day seminar, please include your name, phone number, address, and area in which you plan to become accredited in an e-mail response to icapgenmentoring@comcast.net. You must be registered to attend. The seminar will be held at the Church History Museum Auditorium in Salt Lake City, Utah (the museum is located directly north of the Family History Library. For more information, please click here. We (Legacy Family Tree staff) will be at most of these events so please stop by and say hello. For more information about next week's events, or to see where we'll be the rest of the year, view our online calendar here. How do you remember all of your passwords? I long for the good-ole-days when the only password I had to remember was "Open Sesame". Now I have passwords and user names that I have to remember for all kinds of things - bank accounts, the insurance and credit card companies, genealogy subscription sites, and even my blog accounts. The list does not seem to end. Is this true for anyone else, or do I fight this alone? It would not be so bad if I could have just one password for everything, but of course, once this password is discovered, I've lost the security for everything. I am not writing this article to announce that I have a great system for keeping track of all of my passwords. I do have a system, although I'd like more security and I'd like access to my passwords from any computer. What do you use as your password management system? We have a great new update for you to download. This update includes small bug fixes to Legacy and enhancements to the FamilySearch tools (including the new login method required by FamilySearch). There's a good number of minor issues that have been recently resolved. For a list of what has been fixed, view the April 8 release notes here. Legacy tip - How many of your relatives died in the Influenza Epidemic of 1918? This morning I located the obituary for Herbert S. Harper who died in January 1919. The obituary stated that he died from influenza. His death was one of nearly 50 million who died as a result of the Influenza Epidemic of 1918 that swept the world. I wondered how many others of my 23,017 person Legacy family file died in the same year. Using Legacy's Search tools, this was simple to learn. Go to Search > Find > Detailed Search and enter the following conditions (click on image to enlarge). Then click the Create List button. Legacy found 16 individuals that also died in the year 1919. Since the influenza epidemic began in 1918, I then searched for those in my family file who died in 1918 and added them to the list. Go back to Search > Find > Detailed Search, change the year to 1918. Then in the lower left, change the option to "Add results to existing List". After clicking on the Create List button, my Search Results grew to 46 (combination of persons who died in 1918 or 1919). About a quarter of those died under the age of 20. I don't know that all of these died from the flu, but now I have a nice list that I can print for further research. How many of your relatives died in 1918 or 1919? Follow the steps above to find out. For more about the 1918 Influenza Epidemic, including documents and photos, click here. In April and May we are participating in seminars in Arizona, British Columbia, Idaho, Iowa, Ontario, Quebec, and Utah. We hope you'll be able to stop by and say hello. USA | Iowa | Des Moines - April 17. Iowa Genealogical Society presents a Genealogy Technology seminar by Legacy's Geoff Rasmussen. Visit http://www.iowagenealogy.org/events_activities/index.htm for more information. Canada | British Columbia | Nanaimo - April 17. Nanaimo Family History Society Genealogy Fair. The fair will be held at the Beban Park Social Centre on Saturday, April 17, 2010 from 9:00am to 6:00pm. Stop by the Legacy Family Tree table and see what's new in Legacy and visit with Jim Terry of Millennia Corporation. Contact Sid Norman for details. Canada | Quebec | Pointe Claire - April 17. Quebec Family History Society will demonstrate how Legacy works. Held at the Quebec Family History Society Library (173 Cartier Ave. in Pointe Claire) from 1:00-3:00pm. "Compare some of its features to those of Family Tree Maker or your current program. This program has been highly rated by several sources and is worth considering, especially if you are planning to buy or upgrade in the future. 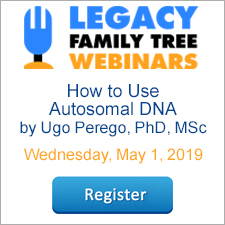 Note that the course will also include tips on how to download your family tree from your current program to Legacy, even if you just want to try it out. 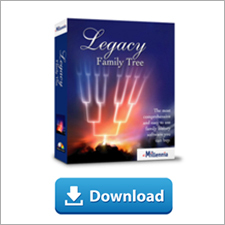 Thanks to the generosity of the Millennia Company, owners of Legacy Family Tree, EACH PARTICIPANT WILL RECEIVE A FREE CD OF THE STANDARD VERSION OF LEGACY 7 and A FREE BROCHURE. IN ADDITION, THERE WILL BE A DOOR PRIZE OF LEGACY 7 DELUXE ! QFHS WILL ALSO RECEIVE A COPY OF VOLUME 1 OF THE TRAINING VIDEOS, WHICH MEMBERS MAY CONSULT." For more information, please visit http://www.qfhs.ca/hap.shtml#seminars. USA | Arizona | Oro Valley - April 21. Sun City Vistoso Genealogy Club's Legacy SIG will have a half-day seminar by Legacy's Geoff Rasmussen. Contact Barb Krecklow for more information. USA | Utah | St. George - April 21/22/23, 2010. St. George Regional Family History Training Center located across the street from the St. George LDS temple. This is a 3-session Legacy class of two hours each day. 10:00am-12:00pm. In addition to the demonstration of how to use Legacy, students will also have hands-on practice along with assignments and handouts to best learn the software. Registration is limited, but is open to anyone. Contact David Midgley for more information. USA | Utah | Salt Lake City - April 26-27. BYU Conference on Computerized Family History and Genealogy. Click here for more information. USA | Utah | Salt Lake City - April 28-May 1. 2010 NGS Family History Conference will be held at the Salt Palace Convention Center. Visit us in booths 617 and 619. Geoff Rasmussen will teach Organize, Plan, and Share Your Genealogy with Legacy Family Tree on May 1 at 8:00am. Visit http://www.ngsgenealogy.org/cs/conference_info for more information. USA | Idaho | Rexburg - May 8. BYU-Idaho Rexburg Family History Conference. Luc Comeau, Legacy's lead developer for the New FamilySearch, Charting, and Research Guidance projects, will present two classes: "Organizing, Planning, Charting, Mapping, and Sharing with Legacy Family Tree" and "FamilySearch Made Easy with Legacy Family Tree". For more information, visit http://www.byui.edu/ce/familyhistory/default.htm. Canada | Ontario | Toronto - May 14-16. Ontario Genealogical Society Conference 2010. Rick Roberts, president of Global Genealogy will be teaching a 2.5 hour workshop on Friday entitled "Working Effectively with Legacy Family Tree." Visit Global Genealogy's booth for Legacy products and questions. Visit http://torontofamilyhistory.org/2010/ for more information. USA | Utah | St. George - May 19-21. St. George Regional Family History Training Center located across the street from the St. George LDS temple. This is a 3-session Legacy class of two hours each day. 10:00am-12:00pm. In addition to the demonstration of how to use Legacy, students will also have hands-on practice along with assignments and handouts to best learn the software. Registration is limited, but is open to anyone. Contact David Midgley for more information or call 435-673-4591. USA | Utah | St. George - May 25-27. St. George Regional Family History Training Center located across the street from the St. George LDS temple. This is a 3-session Legacy class of two hours each day. 6:00-8:00pm. In addition to the demonstration of how to use Legacy, students will also have hands-on practice along with assignments and handouts to best learn the software. Registration is limited, but is open to anyone. Contact David Midgley for more information or call 435-673-4591.